I will share my love to the kids of Kythe by instilling hope into their lives that there are truly descent and good people walking around everyday who knows the true meaning of compassion, empathy, and love. I want them to know that our world is replete with warmth and kindness. And that they are not alone in facing fears, help is available. Unilever Foodsolutions partnered with Kythe to roll out the new 5.5L mayo tubs of Best Foods and Lady’s Choice to its operators to share in this mission. For every "like", Unilever Foodsolutions will donate one Real Love sandwich to pediatric cancer patients until it reaches 10,000 fans in Kythe's partner hospitals. A thousand page likes is equivalent to a 1000 healthy sandwiches. There's no limit, so spread the cause to those who are willing and like to help. You can do your share in the Real Love Campaign by joining its official Facebook page. With every 1,000 “Like” entries until it reaches 10,000 fans, Unilever Foodsolutions will donate 1,000 sandwiches to the different Kythe partner hospitals. 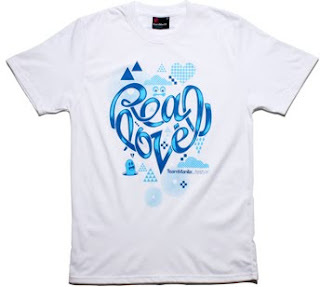 You may also avail of the specially designed, limited-edition shirt Real Love shirt for only 550 pesos in Team Manila outlets in Rockwell, SM Mall of Asia, Trinoma and online through its website. Part of the sale will to go Kythe Foundation , a non-profit organizationfor kids with cancer. You may also support Kythe Inc. cancer-ridden children by joining volunteer and sponsorship opportunities at East Ave. Medical Center Tumor Clinic East Ave. QC 922-6370 or visit www.kythe.org for more information. Also, you may contact Unilever Foodsolutions by sending them an email through foodsolutions.philippines@unilever.com and or via phone call at (1-800)588-8855. This is a week long contest that ends on October 17th.